long, with a puffy round head and no ear tufts. The chocolate to chestnut brown feathers of the head, neck, back and under-parts have many circular or irregular white spots, for which this attractive owl is named. The Northern Spotted Owl has large, round facial discs with dark outer rims, dark brown eyes and a yellowish-green bill. Habitat: In northern part of their range, they live in old-growth coniferous forests. They can use other forest types and rocky canyons, but prefer mature forests. Spotted owls do not make their own nests, They will nest in tree cavities, broken-topped trees and platforms. Diet: This bird hunts at night. The spotted owl eats small and medium-sized mammals, especially rodents. Where available spotted owls prefer flying squirrels and woodrats. Spotted owls have been known to eat bats and other owls.bats and other owls.The spotted owl eats small and medium-sized mammals, especially rodents. Spotted Owl may not breed every year and some do not breed for periods of five to six years. Although survival of juvenile owls is low, adult survival is high, and a Spotted Owl may live to be 17 years old. Because the northern spotted owl has a preference for old-growth forests for their habitat, they are greatly affected by clear-cut logging. 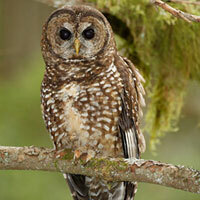 Northern spotted owls are the most-endangered bird in Canada. The roots of their decline? Habitat loss and the arrival of a pugnacious competitor.